A selection of wines tasted at the Spring tasting organised by Liberty Wines, one of the most respected names in the UK wine trade. An importer and distributor of wines to restaurants and independent wine merchants up and down the country, the sure-footed buying at Liberty was established by founder David Gleave MW (below), when he launched Liberty as a specialist importer of Italian wines in 1997. Since then, the company has grown massively, its four original staff now expanded to over 80, and its portfolio of wines now spanning the globe’s northern and southern hemispheres. Italy is still a huge part of the business, but in this selection I have concentrated on wines from other parts of the world, many of which are newer names on the Liberty Roster. The vast majority of Liberty’s wines are exclusive to them and include some of the wine world’s top estates. 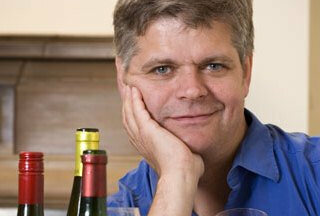 Though Liberty does not sell direct to the public, there is excellent information on all wines at libertywine.co.uk. Liberty’s portfolio tends to have very good distribution amongst independent UK merchants. Therefore I have quoted the RRP for each wine, plus a link to wine-searcher where there are usually several buying options – often a fair bit cheaper than the RRPs quoted. Ripe and rich, but with a nice teasing undercut of herbs and lanolin/straw. Delicious palate – pure, juicy pear and apple, quite full and textured, with very good acidity and freshness. I like the tang and vivacious quality here. 88/100. RRP £9.99, see all stockists on wine-searcher. Blended from Godello and Palomino, this is youthful, with pear droppy notes at first. Very clean, brightly focused, almost a tiny spritz (could be from very recent bottling) but that adds to the freshness and brightness. 87-88/100. RRP £10.99, see all stockists on wine-searcher. Lovely, gently minty and nutty oak, a touch of toffee suggesting very ripe fruit. The palate has delicious fruit: floral and nectarine quality, with dry apple at the core. Very nice acidity and a clean, mint-touched finish. 89/100. RRP £11.99, see all stockists on wine-searcher. Rueda is the source of much inexpensive, Sauvignon Blanc-lookalike wine, but there are some fascinating and more serious examples too. This unoaked example from old busg vines planted at 800 metres has requisite passionfruit and elderflower intensity and pungency, but brims with a distinctive orange filled palate, the grapefruit juiciness of the acidity beautifully managed – not pithy, just fresh, juicy and vital. 90/100. RRP £11.99, see all stockists on wine-searcher. Delightful and fairly subtle nose, the orchard fruits just edged with subtle honey and nutty notes, and framed by a cool minerality. The palate has plenty of juicy, fine flavour. Nicely tight and seems structured, and possibly giving a little more with some time in bottle. 88/100. RRP £19.99, see all stockists on wine-searcher. Beautifully ripe stuff from the Hemel en Aarde, with a Burgundian, buttered cabbage nuance behind the ripe pear and edging into pineapple fruit. That lovely balance of ripeness and exoticism persists, with a fine, tapering finish and lovely balance. 93/100. RRP £21.99, see all stockists on wine-searcher. Delicious nose, lots of cream, lots of the wild, clove and earthy character that is so appealing, a streak of pungent pea pod beneath. Bursts with flavour on the palate, fabulous punch and clarity, really tangy, the mango and nectarine ripeness quickly controlled by the cool, mineral acidity. 93/100. RRP £24.99, see all stockists on wine-searcher. Very fine, floral edged but tight and so mineral. Gently nettle and smoky too. Deliciously pure, real mountain stream clarity and cool precision, the long finish taut and fine, tapering to a fine point. 91/100. RRP £27.99, see all stockists on wine-searcher. More obvious overlay of oak adding delicious notes of whisky barrel and nuts, but quite subtle and not masking the precise fruit. The palate is very cool and restrained, very firm and with good tension, but a burgeoning sense of weight and a little heat say it is a big wine. 92/100. RRP £43.99, see all stockists on wine-searcher. Nice rhubarby vegetal nuances to the solid red and black berries. A certain smokiness too. Deliciously juicy and full, this is packed with fruity personality and with lovely spice, tobacco and chocolate depths. 90/100. RRP £11.99, see all stockists on wine-searcher. Lovely jammy, fresh and yet solid black fruit aromas, but there’s a charm and sense of elegance too. Delicious palate, chocolate-smoothed blackberries and a bite of plum skin, savoury with alert tannin, spice and acid balance. 90/100. RRP £14.99, see all stockists on wine-searcher. Typical Douro blend, and lovely smoky, gently ashy quality to this – a real slate influence. Tight black fruit beneath. Delicious poise and sweetness – a bit of a magic trick to achieve such low alcohol (12.5% ABV) through early picking, but retain so much fruit and silky tannin ripeness. 91/100. RRP £17.99, see all stockists on wine-searcher. A fairly beefy 14.5% ABV. Much more floral, singing, high-toned notes than the Classico, with espresso and meaty black fruit beneath. Deliciously supple edges here: it is dry, and there is plenty of extract, but it retains enough life and energy. Cherry skins and plums abound. 90/100. RRP £23.99, see all stockists on wine-searcher. Rhubarb and beetroot, a touch of briary, woodland and a cherry and bramble fruit. Very attractive. Quite full, delicious palate, good ripeness, lots of sweet fruit and a spicy, svelte and classy finish. Not enormously complex but utterly charming. 91/100. RRP £39.99, see all stockists on wine-searcher. From the Sonoma Coast, this leaps in price but is a superb Pinot by any measure. From Ted Lemon’s biodynamic estate in the north of California’s vineyard country, on the true coast of Sonoma, this single vineyard wine is more subtle than the straight Sonoma Coast cuvée with a briary, brackeny, even cool green character, with more beetroot vegatility too. The freshness and layered depth on the palate is outstanding, lots of juiciness matched by creamy texture and tannins, but subtly layered, spicy and beguiling. 94/100. RRP £64.99, see all stockists on wine-searcher.